One of the first seminars for the Solar Wave Theory Group this year was a highly informative presentation entitled "Cycle to cycle variations in solar activity: oscillator models and prospects for cycles 24 and 25". The first part of this seminar was a presentation of a systematic study of the parameter space of the van der Pol and van der Pol-Duffing oscillators, identifying parameter domains where a behaviour analogous to the observed characteristics of the sunspot number series is shown. The implications of the findings for the solar dynamo were discussed. 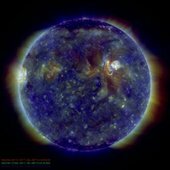 In the second part we were presented with a discussion of the current status of solar activity and forecasts for cycles 24 and 25. Galileo discovered sunspots around 1612, since then, ongoing study has revealed an 11 year cycle. This seminar lived upto its expectations. A four hundred year record of Sunspot observations is shown below. 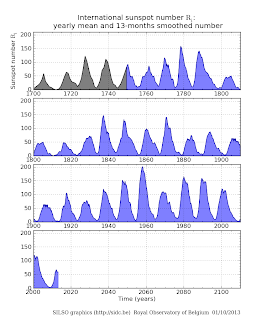 The Maunder minimum is the long period shown very clearly from 1650-1700 whilst the Dalton Minima occurred between 1800 and 1825. In order to understand these phenomena we understand the solar magnetic field as a dipole at high polar latitudes. It is believed that the variations constituting the solar cycle arise from the hydro-magnetic dynamo which starts at the bottom of the convective zone of the sun. 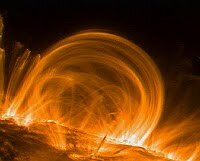 Tubes of magnetic flux formed in the solar interior and resulting from turbulent mixing it takes around 5-6 years (half of the solar cycle time) for these to appear as sunspots on the solar surface. The duration of the solar cycle and the distribution of sunspots on the solar surface is therefore determined by the mechanisms which affect the travel time of flux tubes to the solar surface. The sunspot distribution visualised using the Butterfly diagrams (for example see below) results from the motion in longitude and latitude of the sunspots in the solar surface. 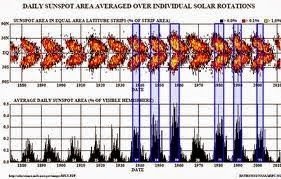 It can be seen that a minority of sunspots migrate towards the solar poles whilst the majority goto the equator. 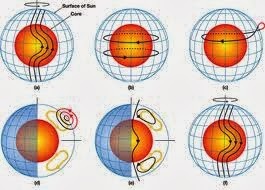 These effects are determined by the nature of the solar dynamo the diagrams below illustrate how the field distribution is determined by the differential rotation. The so called flux transport dynamo is used by some models to simulate and predict solar cycles. The Hale law describes the nature of the butterfly diagram. Sunspots form in pairs and the polarity of the leading spot matches the polarity of the polar cap (in the same hemisphere), this is called Hales polarity law. The line connecting the leading spot to the following spot is tilted toward the equator, the tilt angle increases with solar latitude, this is called Joy's Law. The Waldmeier effect is the relation that the rise time in months is approximately 35 + 1800 /(amplitude in sunspot number). The “Waldmeier effect,” is an anticorrelation between the peak in sunspot number of a cycle and the time from minimum to reach that peak. These effects can be attributed to the solar dynamo and good simulations will predict these distribution laws. The final part of the seminar was fascinating as it presented the interesting idea of the reduction of sunspot numbers and the possibility of a grand minima (e.g. the Maunder minimum). This is currently controversial as it has been suggested that this deepest of solar minima may result in the disappearance of sunspots for cycle 25! The Waldmeier Effect: An Artifact of the Definition of Wolf Sunspot Number?